Nearly 200 filmmakers from all over the world have signed a petition protesting an American court’s strictures against the director of the critically-acclaimed documentary, Crude: The Real Price of Oil . 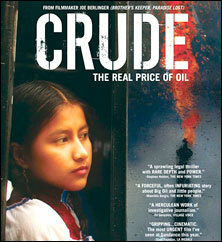 On May 15 a New York court ordered director Joe Berlinger to hand over unused footage from his film to Chevron. The oil giant claims the footage documents improper conduct by the attorneys representing Amazonian peasant farmers and indigenous people in a US $27 billion suit. Chevron says Berlinger had deliberately omitted scenes that could prove important in resolving a 15-year old legal battle. The oil giant had requested Berlinger and producer Michael Bonfiglio to turn over the unused footage. They tried to quash the request, arguing journalists’ right to refuse to divulge information from confidential sources.The creators of the documentary, which was released last year, then went to court to quash Chevron’s effort to subpoena the material. But Judge Lewis Kaplan ruled in Chevron’s favour, ordering Berlinger and Bonfiglio producers to turn over more than 600 hours of footage to the oil major. Some 30,000 Indians and inhabitants of Ecuador’s northeastern Amazon region first sued Texaco—acquired by Chevron in 2001—15 years ago for alleged environment damage from 1964 to 1992, when Texaco operated in Ecuador as part of a consortium with state-run oil firm Petroecuador.